Outfielder Nick Sinay is willing to do whatever it takes to help his team win games. Whether that be getting hit by a pitch, drawing a walk, or driving a ball into the outfield for a hit; Sinay is a weapon for his team and a pest to opponents with his great base running skills. Getting on base and swiping bags hasn’t been an issue in the early going of Sinay’s career. Carrying a .415 OBP and recording 47 steals in 97 professional contests has been an excellent start to the young grinder’s career. But despite his impressive steal totals in the early stages of his career; Sinay is eyeing bigger goals for his first full season in Lansing. But Sinay’s grinding status doesn’t end at the plate though, as the speedster has zero issues manning his position. In fact, Sinay has only committed two errors in his 746 innings in the outfield. The excellent play has helped Sinay maintain an impressive .989 career fielding percentage that should only get better with more exposure. Feeling his range is what makes him such a weapon in the field, Sinay takes great pride in his ability to rob hits from opposing hitters. 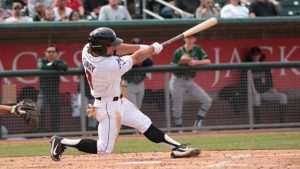 Fans in Lansing will get to see Nick Sinay go all out for their Lugnuts’ this season, as he looks to leave a footprint in the Midwest League in 2017. I hope to get down to watch him play. Brian you cover the minors do re call and one teaching these kids how to bunt. If so how often do they practise it.